Happy New Year! After a full week back at work for most, I’m a little slow off the mark but I promise this recipe is more than worth the wait. We’re jumping into January with a bang: there’s caramel, chocolate, gooey salty-sweetness and not a leaf of kale in sight. Although if you’re the kale eating kind, don’t click away yet because these, believe it or not, are healthy salted caramels. 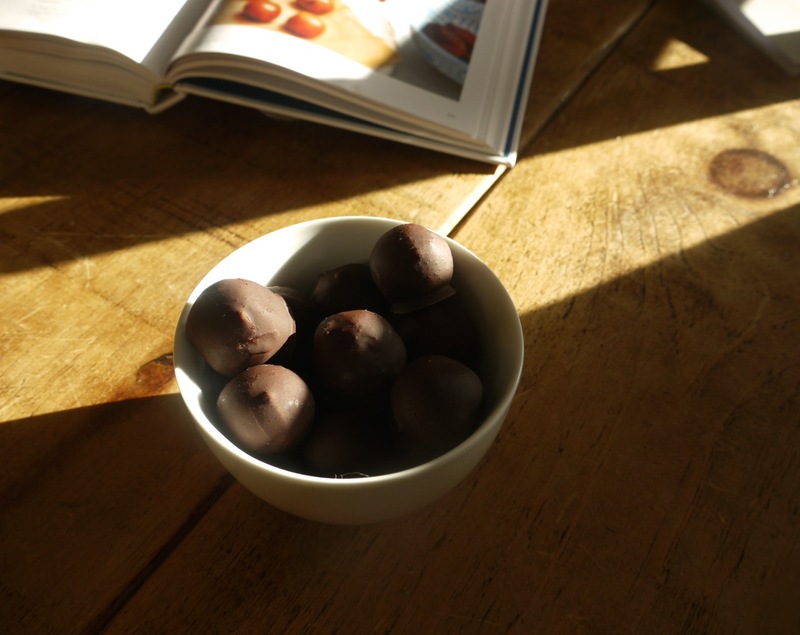 Not healthy in the ‘dark chocolate contains beneficial antioxidants’ vein but bone-fide, refined sugar free, fruit-filled caramels coated in homemade chocolate made with cocoa butter, powder and honey. 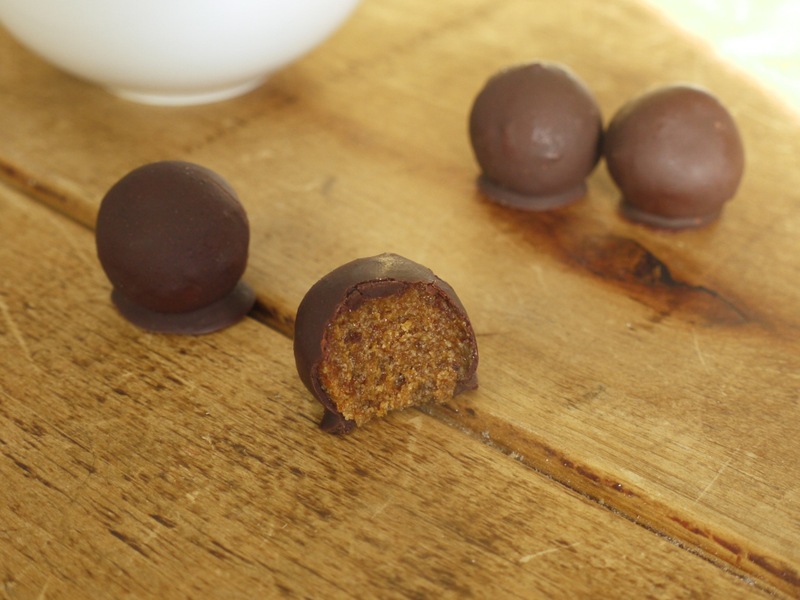 The sweetness and texture comes from squidgy unsulphered apricots blended together with coconut oil and salt – an idea not a million miles from the Homemade Nakd Bars I posted a few weeks back – and the omission of nuts means the end result is softer, gooier and altogether more indulgent. The recipe comes from Jasmine and Melissa Hemsley’s The Art of Eating Well, one of the most talked about cookbooks of 2014 and – I imagine – set to fly off the shelves this January as people try to shift those extra Christmas pounds. As you might expect from the sweet section in any modern, health conscious cookbook there are avocados masquerading as chocolate mousse, banana ‘ice cream’, ground almonds and nut butters. And as with any ‘alternative’ recipe, you’ll need to bear in mind that because they’re made with apricot, these don’t taste exactly like a salted caramel. But they do taste divine. Share only with loved ones, six in one sitting, gone in one weekend divine. If the thought of another week without naps in front of the telly, mid-afternoon alcohol and a family sized box of chocolates to slowly work your way through makes you feel weak, don’t go cold turkey. Make these apricot caramels. Revel in the smug knowledge that they’re healthy caramels, that you made your own chocolate (!) and that you’re taking small steps towards a healthier, less sugar-laden lifestyle. Ps next week I’ll be back with the cover for MY COOKBOOK (!!!) which I’m beyond excited to share with you all. It isn’t out until 4th June, so I’m hoping by that time you’ll be more than ready to retox with a healthy dose of sugar, butter, chocolate and cream. 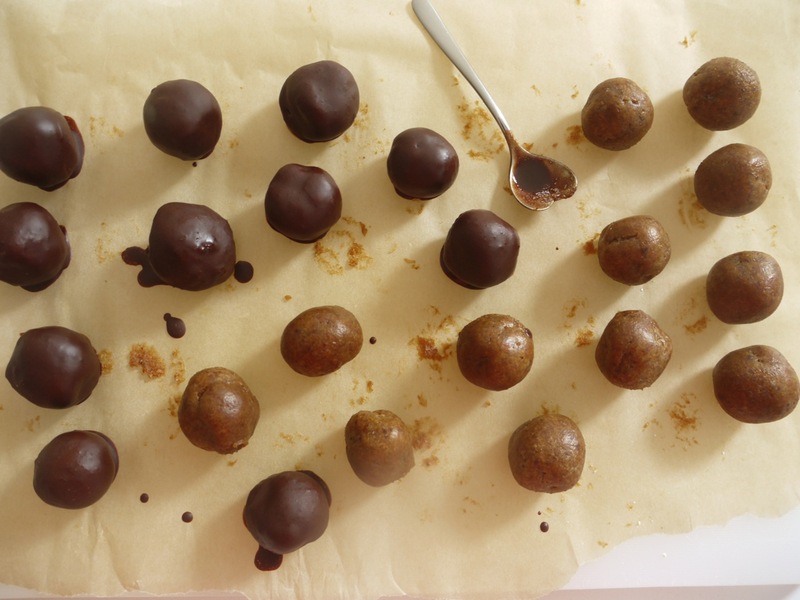 Salty-sweet snack balls made from good-for-you ingredients, barely adapted from The Art of Eating Well. In a food processor, combine the apricots, salt, coconut oil, water and vanilla and blitz until smooth. Transfer to a small container and freeze for 10 minutes. Line a tray with baking parchment. Remove your container from the freezer and use a teaspoon to scoop out enough apricot mixture to make small balls, about 1.5cm in diameter. Roll between your palms until smooth then place on the prepared tray. Return the tray to the freezer for 20 minutes. To make the chocolate, melt the cocoa butter in a heatproof bowl suspended over a pan of barely simmering water, reserving a couple of small chunks. Once melted remove from the heat and add the reserved cocoa butter. Whisk in the cacao powder, honey and vanila until smooth then set aside to cool slightly. 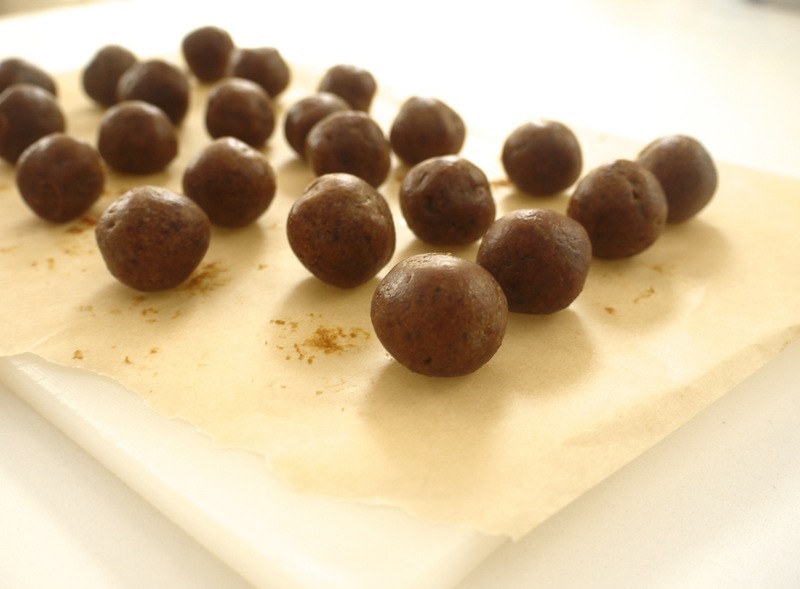 To coat the balls, use two teaspoons to dip one at a time in the chocolate then return to the baking parchment lined tray. 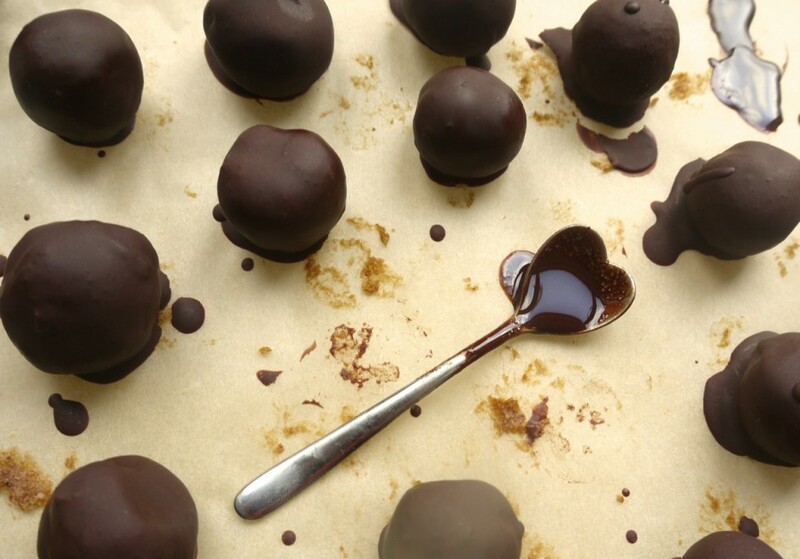 Allow to firm up for a minute or two (because the balls are semi-frozen, the chocolate will solidify quickly) then dip a second time. Allow to firm up then store in the fridge until ready to eat. Now I know what to do with that packet of cocoa butter that I’ve had in my cupboard for years! These look delicious and I love the idea of making my own chocolate!! I bookmarked this recipe to try when I read through The Art of Eating Well as they sounded intriguing – good to know they’re actually delicious too! PS super excited to see the cookbook cover!! I love love love the sound of these. I definitely go through phases with dried fruit, adding it to every bowl of porridge and muesli and always carrying a small tupperware box with me when I head to work so I have something decent to snack on when the office vending machine comes calling come 4pm. And then I kind of stop eating dried fruit completely for a while. 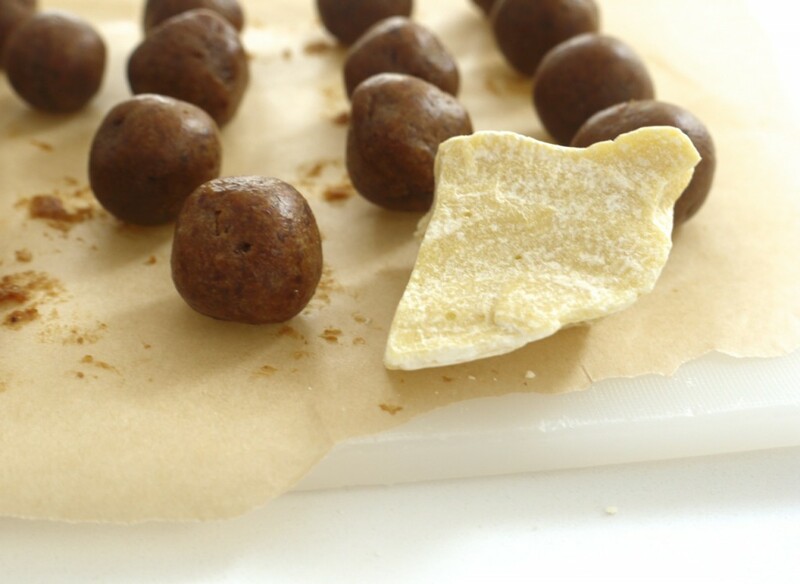 I am currently on a big medjool date binge (a fat medjool date, a square of dark chocolate and a pinch of sea salt is my go-to post dinner snack these days) and was thinking how similar to chewy caramel some dried fruits can be and how someone should try turning dates and chocolate into date ‘Rolos’. I have yet to try this with apricots, but your post is telling me I clearly should! Also, cannot wait to see your book cover – I may or may not have snooped around amazon the other day and was sad it did not have a cover yet!